When you combine the presence of oxygen, moisture, and certain other materials, corrosion can occur. This corrosion can cause long-term damage and ruin the structure and operation of various mechanical and industrial components. Transmission lines are no exception. In addition to corrosion, transmission lines can also be vulnerable to voltage arcs and oxidization when oxygen and moisture are present. Not only will these problems jeopardize the integrity of the lines, the equipment and broadcasted end product can also be compromised. The best way to prevent these inconvenient and often costly issues is to utilize Nitrogen gas. By positively pressurizing the transmission line with supervisory Nitrogen generated by South-Tek's N2-GEN® TL Series - Arc Suppression System, the dew point within the line can be kept lower than the temperature of the line itself. This effectively displaces the oxygen and moisture and greatly reduces the risk of voltage arcs, corrosion and other problematic reactions. This system can also be equipped with our AutoPurge System and BlastOff Leak Detection System, to further enhance your Nitrogen Generator's performance. The AutoPurge System is designed to control positive pressure within the transmission line and maximize the life of the overall Nitrogen Generation System. The BlastOff Leak Detection System comes standard equipped with every N2-GEN Nitrogen Generator from South-Tek Systems. It allows the user to know immediately when there is a leak or when the system is running excessively to compensate for the leak. This can help detect leaks before they become significant and alert the user so they can address the issue right away. 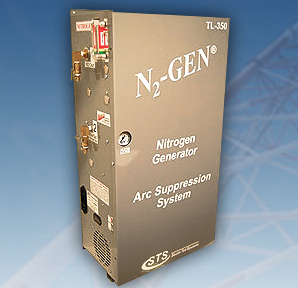 You can learn more about the N2-GEN® TL Series - Arc Suppression System and other Nitrogen Generation products by visiting our website, downloading the N2-GEN Arc Suppression System Brochure, or by contacting us directly at 888-526-6284.